This stylish, simplistic drafting table with room for keyboard and computer tower will provide security for your valuables, and comfort for your workspace. The HANN CAD Drawing Table with Keyboard is a perfect chameleon workspace for your studio. Large enough to house those big projects, but also able to accommodate your technological needs, this drawing table is the ultimate combination of classic and modern. 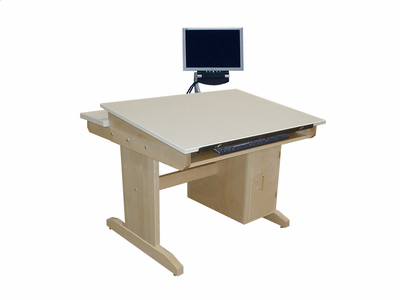 The drafting-table top is supported on a heavy-duty pedestal style base. The workspace is slanted with a flat panel monitor arm and keyboard tray for when you need to swap media. This attractive piece is all-maple with a natural finish. The locking cabinet provides security for your computer tower and prevents damage or theft when you're not at your desk. The monitor stand is positions at ideal eye-level to prevent back or neck strain. The desk's overall dimensions are 42" wide by 40 1/2" deep and 33" high. Perfect for a corner or mid-room, this desk will look great wherever you want (and need) to place it. Please note that this item is oversized and will, therefore, incur a shipping cost of $105.95. This item generally ships in four to six weeks.